2018 is a wrap! We realised the 42workspace dream of creating a booming hub for tech startups in Rotterdam. Now we are home to many successful and fast growing tech companies, ranging from AI, blockchain, crypto, tech education, real estate/ prop-tech, agri-tech, ad-tech and cyber security front runners to next-gen platform builders. 42workspace is founded by tech entrepreneurs, for tech entrepreneurs. In 2018 our curated tech community grew to 200 members and our residents raised a staggering € 12.6 million of funding. Our rapid growing tech companies need more place to expand and many new tech companies are looking forward to also become part of the 42workspace tech community! So we are actively searching for a second 42workspace location where we can host more and bigger tech companies. We are open for suggestions 🙂 2019 here we go! 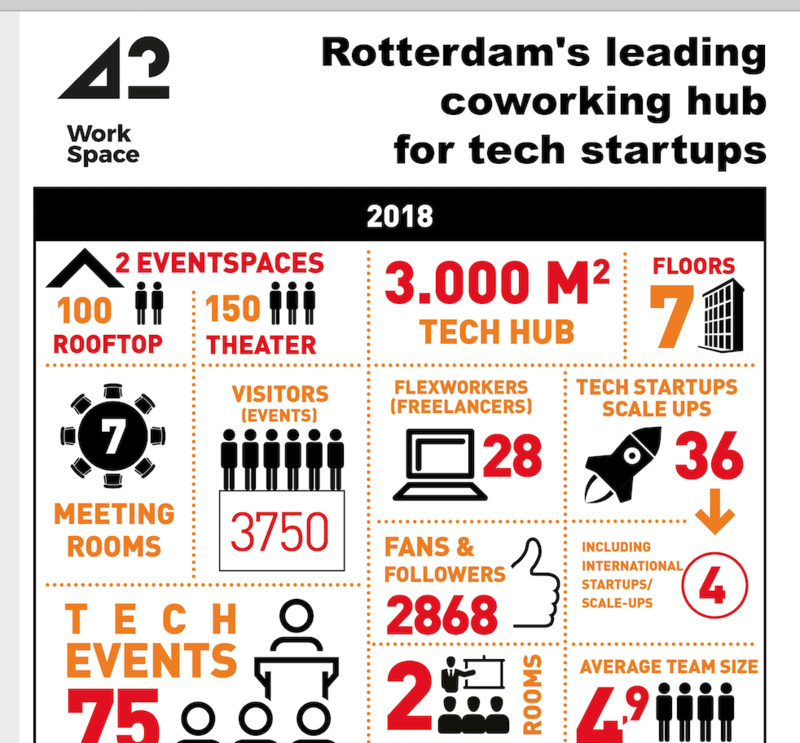 42workspace keeps on boosting the tech scene with winning tech innovators, more and better events, relevant workshops and meetups that bring together the tech community. But to build the next tech powerhouse it requires many parties to join forces. So we co-founded WeTechRotterdam, a foundation that supports the full tech ecosystem by a strong collaboration with other innovation hubs, tech scale-ups, tech talent, the Rotterdam municipality, Rotterdam Partners, Innovation Quarters, the regional universities, tech change makers, investors and Startup Delta. Rotterdam: Make IT Happen.